Lewis Hamilton says his post-season helmet swap with Sebastian Vettel is the "ultimate" sign of the respect held between the rivals. The pair once again went toe-to-toe for title honours in 2018, with Hamilton and Mercedes coming out on top over Vettel and Ferrari. A trademark mid-season surge in form helped Hamilton seal a fifth world title ahead of Vettel, who was also out to add a fifth crown to his collection. 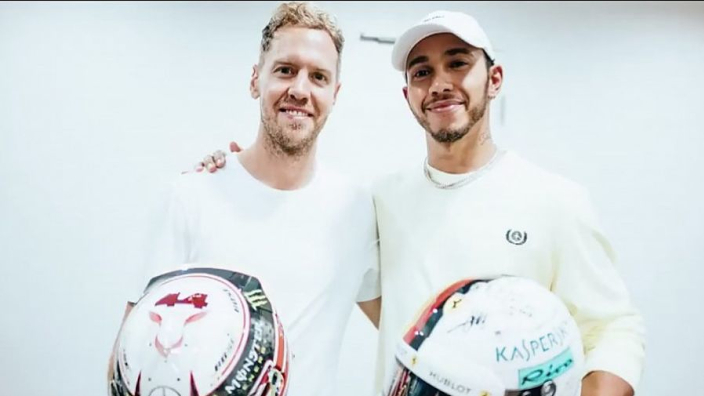 The pair traded respectful words throughout the campaign, a slight contrast to the previous year when Vettel barging into Hamilton behind the safety car in Baku had strained tensions. Hamilton said a rare text from Vettel put the plan into place as the rivals displayed their admiration for each other following the season-ending Abu Dhabi GP. "Footballers do it all the time, but helmets are a lot more expensive than football jerseys – they get thrown about – these things are quite precious to us and I personally don't give any of my helmets away. "I swapped one with Michael [Schumacher]. I think there might have been one or two other drivers that I happened to have exchanged helmets with, so I don't look upon it lightly. "But this was really quite, I would say, a privileged moment because I'm standing next to a four-time world champion, who's achieved a great amount, who's actually a really great man and incredible driver, and we're swapping our helmets. "It's really the final chapter of your respect for another driver – particularly when you're in the heat of battle – when you exchange helmets, it's like the ultimate sign of respect." Images of the swap soon swept social media, although Hamilton says it was supposed to have been an experience for just the pair to share. He explained: "It was a cool moment – it was supposed to be a private moment just for us – but it ended up being shared on social media, which ultimately is OK. It's cool for people to see it."